Submarine cable to connect the DeltaStream unit to the power conversion centre. The DeltaStream device was originally conceived in Pembrokeshire and will be able to lead the way in combating climate change from the heart of West Wales, providing a viable and effective solution to meet global energy demands in an environmentally friendly way. From 2009 to 2012, a design team at Cranfield University tested the scale model of DeltaStream in France, with the support of the Carbon Trust. The results of these tests were positive and the engineers were able to validate the design of the device, enabling the project to begin construction. The DeltaStream device was installed in December 2015 until March 2016. In December 2016 media reports surfaced that a fault with the active sonar which was supposed to monitor for potential collisions between marine mammals and the turbine, since then the device had been sitting idle. This meant that the project could no longer operate within its licence due to the inability to monitor for potential collisions. Further reports in the BBC also indicated that another mechanical defect which would have stopped the turbine from producing electricity was later identified. In October 2016 Tidal Energy Ltd went into administration, a buyer for the company is still uncertain. While future development is currently unlikely to occur, the deployment starting December 2015 was successul in many ways and the results from this installation are still applicable. Planning permission for the temporary on-shore works was granted by the Pembrokeshire Coast National Park Authority in October 2009. Since 2008 an extensive consultation process has been undertaken with statutory and non-statutory organizations and individuals. The results of these consultations led to the completion of the Environmental Impact Assessment (EIA) in 2009. The results of the EIA were submitted with the license applications to the regulatory Authorities (the Welsh Government (WG) and the Department for Energy and Climate Change (DECC)) in October 2009. Licenses were granted by DECC and WG in March 2011 and TEL installed the DeltaStream unit in December 2015. 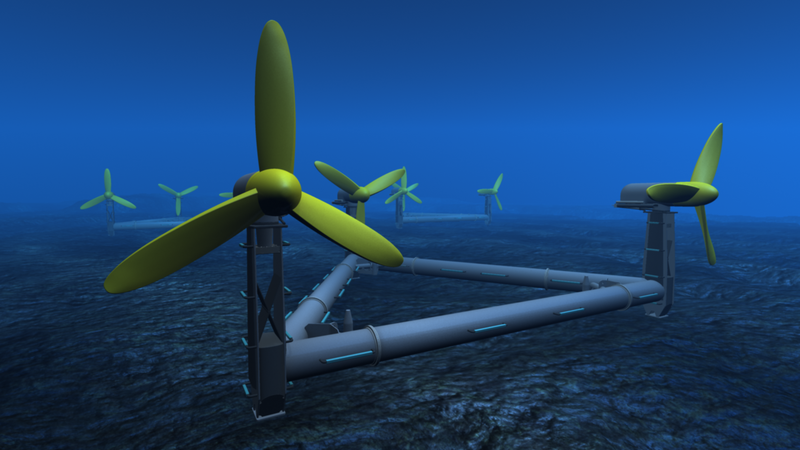 The main funder and driving force behind Tidal Energy Ltd (TEL) is Eco2 Ltd, Wales’ leading renewable energy company. TEL has also received funding from Carbon Connections UK Ltd, the Carbon Trust and a £6.4m EU grant through the European Regional Development Fund (ERDF) in 2011 and a further £1.6m in May 2013. TEL went into administration in October 2016. In addition Pembrokeshire also has a Local Biodiversity Plan (LBAP), which has been set up to improve the status of habitats within the region. The following species/habitats, identified within the Pembrokeshire LBAP, are present in and around the proposed deployment site for the DeltaStream device. Ramsey Sound is located in United Kingdom. Possible effects on tidal flow, waves, sediment in the water, the area of seabed affects, and water quality. Only 7 days for installation of one device and cable, resulting in small effects. Device base is about .00002% of Marine SAC. Disturbance from installation/removal marine vessels. Literature studies and review of data records. Short installation period and slow speeds from barges would be or minor adverse significance. Noise disturbance and displacement from critical habitat. Harbour Porpoise will hear the device from 280m; grey seals will hear the device from 150m. Location is far from main foraging areas and footprint is small, so a minor adverse effect is expected. Noise will provide advance warning to avoid the device. The slack tidal phase is when porpoises are most likely to pass by the area, during which time the blade rotating speeds will be slow. Species present and associated risks. Land based survey between January and October 2009. 21 species identified, 4 were associated with adjacent SPA. Collision with the device and loss of foraging habitat are of little concern because of the low number of diving birds observed. Effects on marine animals living underwater on the seabed. The small footprint of device and cables result in negligible effects. Risk of collision or loss of habitat. Strong tidal flow and rocky reefs do not support many commercial fish. Some crab and lobster potting, but not in direct vicinity of the project. Expected negligible to low significance impact. Classify potential risks to boats for all stages of development. Ramsey Sound is a generally hazardous area for navigation due to strong flows and tidally submerged rocks. Commercial shipping traffic is routed away from the Sound; smaller boats are present during the summer season. A safety zone will be requested around the device during all stages. Monitoring studies carried out after the installation of the turbine. Monitor changes in bird usage of Ramsey Sound. Hydrophone equipment to monitor the usage of the area by echolocating marine mammals, e.g. harbor porpoise. Four hydrophones were mounted on the Deltastream device which allowed TEL to track marine mammals in three dimensions.